" Articles in Category: Nancy Pelosi	"
Barr's willingness to offer Trumpian lies to the American people about what the report actually says and doesn't was swell until the American people were actually allowed to read it. Trump's repeated and now well-documented attempts at criminal obstruction of justice by trying to shutdown or otherwise derail the Special Counsel's probe is now detailed for all to see, as of Thursday public release of the redacted 448-page report [PDF]. They are also now able to read Mueller's clarion call, also detailed in the report, for Congress to take up the matter as per their Constitutional duty to serve as the only real check on a lawless President. House Judiciary Chair Jerry Nadler (D-NY) has now subpoenaed the Dept. of Justice for the full, unredacted version of the report and its underlying evidence, and has called for both Barr and Mueller himself to testify to Congress in the coming weeks. At the same time, more House members are now calling for impeachment to get under way after, as Rep. Alexandria Ocasio-Cortez (D-NY) notes: "Mueller’s report is clear in pointing to Congress’ responsibility in investigating obstruction of justice by the President" and "squarely puts this on our doorstep." "While I understand the political reality of the Senate + election considerations," she Tweeted, "upon reading this DoJ report, which explicitly names Congress in determining obstruction, I cannot see a reason for us to abdicate from our constitutionally mandated responsibility to investigate." For his part, after falsely hailing the report as a "total and complete exoneration" before it was publicly released, Donald Trump (who probably, ya know, should have bothered to read it first) returned to angry form as of Friday morning, railing profanely and incoherently against the report, the respected federal prosecutors and Republican former FBI Director who wrote it after a meticulous two-year process, and against his own top level staffers who are revealed in the report as the best witnesses to Trump's various impeachable high crimes and misdemeanors. We're joined today by award-winning opinion and analysis journalist HEATHER DIGBY PARTON of Salon and Digby's Hullabaloo for her insight into the report itself --- which she describes as a "roadmap for impeachment" --- and its fallout today as even several Presidential candidates are now joining the growing calls for impeachment proceedings to begin in the U.S. House. 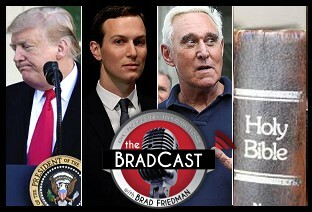 Among the many topics of our lively discussion: Bill Barr's BS; Mueller's reasoning for choosing to not prosecute while passing the ball firmly to Congress to pick up instead; Why Don Jr. wasn't charged (but should have been); Whether the long-standing DoJ guidance prohibiting sitting Presidents from being indicted makes any sense, either legally, Constitutionally or politically; and whether Democrats in the House and Senate (not to mention Republicans there) will find the backbone to do the right thing and hold Trump accountable as per their Constitutional responsibilities, or whether they'll continue to pull punches as they have for so many years. That, as we also discuss, is precisely what has allowed dangerously criminal and unfit clowns like Donald Trump to ascend to the Presidency in the first place. "If we care about the Constitution, and we care about the democracy, you can't just let this kind of stuff go." Parton argues. "Even if they can't get the Republicans [in the Senate] to convict, I think that they have to do it anyway. It's the right thing to do. They have to lay out the case." "Most Americans are not going to read that report like I just did. They're just going to hear snippets of it. But if they do impeachment hearings, in which they establish this narrative out there for all Americans to see, and to hear it in their own words --- from Robert Mueller to Don McGahn, to Hope Hicks, to everyone of them --- and hear what they have to say, to describe what happened, I think that's important for the record. It's important for the voters to have that as they go to the voting booth, whether Trump is convicted or not." And, on a far more more hopeful note, the 37-year old, openly gay, Afghanistan war vet and South Bend, Indiana Mayor Pete Buttigieg officially announced his run for the Democratic nomination for President over the weekend. Next, speaking of elections, and before we are joined by our guest today, University of Kentucky College of Law election Professor JOSHUA A. DOUGLAS, a story of GOPers making it more difficult to register voters in Tennessee, and another on Republican state lawmakers working to make it next to impossible for progressives in Arkansas to place citizen initiatives on the ballot, after the state voted to increase the minimum wage via a ballot measure in 2018. Douglas, author of the brand new book Vote for US: How to Take Back Our Elections and Change the Future of Voting, details a few of the stories from his book revealing how regular citizens in recent years have succeeded in pushing for local and state measures that have resulted in the expansion of the franchise, even in the face of the dark forces hoping to restrict access to the voting booth. He shares, for example, the story of the Kentucky man who lost his right to vote for life in the state for stealing a car as a teenager decades ago, who was able to encourage his state's legislature to change the law to re-enfranchise those who have completed their sentences. And the story of the woman in Michigan whose anti-gerrymandering ballot initiative was adopted by voters last November. Both stories are told in more detail in his book. With so many stories in the news (and our program!) of voting rights being taken away or otherwise restricted, its important for folks to understand they can actually change that equation without relying on Congress or even major civil rights groups, often by taking action themselves. "What I like to focus on, in addition to the doom and gloom that seems to invade our psyche with respect to the right to vote, are the positive stories of progress and success," Douglas tells me. "There's power in these inspiring stories that I tell in the book about ways to make our voting process more convenient and inclusive. We can quibble about some of the details, but hopefully the overarching message that we need to take back our elections through local grassroots work can really take hold." The Trump Administration evacuated the last of the remaining U.S. diplomats in Venezuela on Monday night, saying their presence in the country has become a "constraint" on U.S. policy there, whatever that may ominously mean. Top Trump officials have been threatening the administration of President Nicolas Maduro for several months since opposition leader Juan Guaido declared himself to be President of the nation in turmoil. Since late last week, power outages have crippled the country, with each side blaming the other and Maduro charging the U.S. has sabotaged the power grid with cyberattacks. But some excellent reporting by the New York Times over the weekend reveals, yet again, that many of the claims against Maduro being made by Trump Administration and supportive Republicans in Congress like Sen. Marco Rubio, are based on completely false information. On Sunday, the Times published a video report revealing that claims by Trump officials from National Security Advisor John Bolton to Sec. of State Mike Pompeo to Vice President Mike Pence and, yes, Rubio, charging that Maduro's forces set fire to aid trucks coming from Colombia are inaccurate. In fact, as the Times' unearthed video reveals, it was protesters in support of Guaido on the Colombian side of the border who caused the fires. This is just one more reason to be skeptical about Trump's intentions in the troubled South American nation (and media reports of same) as his own political fortunes worsen at home. On Friday, Washington state Governor Jay Inslee became the latest Democratic to announce his intention to seek the 2020 nomination for President amidst an already very crowded field. He's the first Governor to jump into the fray, as we're now just months away from the start of Democratic Party Primary Debates beginning in June. He's also the first Dem to make it his "number one priority" to "rise up to the most urgent challenge of our time: defeating climate change." Even so, Inslee, unlike many of the other announced hopefuls, has yet to fully endorse the Green New Deal resolution [PDF] recently introduced by Rep. Alexandria Ocasio-Cortez (D-NY) and Senator Ed Markey (D-MA), preferring instead a more piece-meal approach. The GND is a sweeping, ten-year blueprint for a wartime-like push to transition the American economy and power-grid to 100% carbon-neutrality by 2030, while providing millions of public works jobs to upgrade U.S. infrastructure, clean up legacy pollution, and ensure that vulnerable communities, including coal miners, survive and thrive the crucial transition. Last week, a group of children from the Sunrise Movement visited the office of Sen. Dianne Feinstein (D-CA) to urge her support for the GND. The 85-year old Senator appeared to speak down to the kids, explaining that she had her own version [PDF] of a Green New Deal that, she believed, unlike the AOC/Markey proposal, could gain Republican support while also including a mechanism to fund itself. While a viral edited video of the encounter between the Senator and the children makes it look worse than it really was, even the full length version (which is marginally better, if still not great) reveals the long-serving California Democrat doesn't truly seem to grasp the urgency of the moment that scientists have now been warning about for decades. 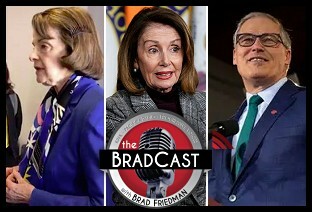 We're joined to discuss all of this today by environmental reporter EMILY ATKIN who received some push-back recently from Democrats after arguing at The New Republic that Dems like Feinstein present a "bigger threat to the left's goal of slowing climate change before it's too late" than even out-and-out climate science deniers like Donald Trump. At the same time, she makes the case in a separate article this week that House Speaker Nancy Pelosi --- who has taken some heat herself for appearing to dismiss the GND as a "green dream" --- is actually a valuable ally who hopes to see advocates rally public support for the program. "What I mean is that [Feinstein] is a bigger threat [than Trump] to our one opportunity that we have to make a dent in climate change, to make a significant dent," Atkin explains, detailing the urgency of the next twelve years that world scientists find to be the last chance to avoid the worst impacts of global warming. "Feinstein has a preoccupation at this moment with what's passable with Republicans in charge. She's focusing on this in a moment when they're not going to pass anything either way, because Republicans are in charge. Right now is the time to mobilize on the idea of the most aggressive, most exciting climate plan possible. And use that to take control of the House and the Senate and the Presidency in 2020 --- and then you talk about what is passable." Atkins says the DiFi legislation is "mostly a reinstatement of the status quo during the Obama Administration. So, putting back all of the regulations for the climate that Trump is attempting and has repealed. Getting back into the Paris Climate Agreement. Putting forth another big money mobilization in new technologies. It doesn't call for any of the social reforms that Ocasio-Cortez's Green New Deal resolution calls for." "The path forward is to support something exciting, demonstrate that you know, as a Democrat, what it means when you say climate change is the biggest crisis of our time. Which is what Dianne Feinstein said, but doesn't demonstrate it with the type of plan she put forward," she tells me. "The path forward right now is to demonstrate to voters that you truly understand the magnitude of this crisis. That you're willing to support societal change to get there. Excite people, make them hopeful for the future, instead of saying well, we're going to support this lukewarm thing that's not going to do anything. And then people are just drawn back into apathy." We've got lots to discuss on all of those fronts today as Atkin details her arguments and offers her thoughts on Inslee's candidacy as well. Also today, Congressional Republicans are still having a very difficult time constructing a defense for the indefensible Donald Trump following Michael Cohen's stunning U.S. House Oversight Committee testimony on Wednesday, when he detailed [PDF], with documentation, at least five felonies that Trump appears to have committed both before and after becoming President. But Trump's former nemesis-turned-lapdog Sen. Lindsey Graham (R-SC) managed to cobble together a defense --- if a pretty thin one --- for one of the most serious alleged felonies detailed by Cohen. For his part, the President himself sputtered out another unhinged attempt at defending himself by attacking Cohen as a liar in a Twitter rant this morning. Finally, as we wrap up another extraordinary week, NBC News reports that Congressional Dems in the Ways and Means Committee now plan to request 10 years of Trump's tax returns from the IRS, following on information provided by Cohen. Leading off today's rather lively show: The federal utility board known as the Tennessee Valley Authority (TVA), now dominated by Donald Trump appointees, voted today to shut down the last remaining coal-fired power plant in Muhlenberg County, Kentucky, once the heart of "Coal Country" as the nation's top producer. The move is expected to save some $320 million dollars for 10 million rate-payers in the region, not to mention the resulting cleaner air and water and lower medical expenses in the bargain. The decisive 6 to 1 vote (which includes 4 Trump appointees) to close the dirty, inefficient decades-old plant comes despite pleas to the board from Kentucky Sen. Mitch McConnell, Trump himself and one of his top donors (Robert Murray of Murray Energy) who owns the nearby mine that supplies the plant. The TVA also voted to close another coal plant in Tennessee. Several hundred of jobs will be lost in the bargain, which gives us the opportunity to remind listeners of Hillary Clinton's 2016 plan to invest $30 billion for support and retraining of miners and others effected by coal's inevitable end. It was while describing that plan when Clinton correctly, if infamously, noted that "we're gonna put a lot of coal miners and coal companies out of business". The phrase was then opportunistically taken out of context by Fox 'News', Republicans and Trump himself to endlessly blast her during the campaign, even though she had been explaining the need to help those effected Coal Country miners and families to survive. Those miners, most of whom fell for the dishonest Rightwing smears and voted for Trump, will soon be out of work without the help Clinton had tried to offer them. In other news: The U.S. Senate confirmed William Barr, largely along party lines, as the next U.S. Attorney General at a crucial moment in the Robert Mueller Special Counsel probe. The Senate also voted to approve a $330 billion compromise bill to fund the Government, including $23 billion for border security, but just $1.4 billion for Trump's border wall, less than he would have gotten had he accepted the deal offered last December. Instead, he shut down the federal government for a record 35 days. The House just approved it as well, though a small group of progressive freshman Congresswomen vowed to vote against the measure due to its increased funding for U.S. Customs and Border Protection (CBP) and Immigration and Customs Enforcement (ICE). The spending bill is expected to pass the House nonetheless and, Ann Coulter's ALL-CAPS Twitter threat notwithstanding, McConnell has said that Trump intends to both sign it and then declare a "National Emergency" in order to steal tax-payer funds from elsewhere to fund his border wall. That move, if it happens, will be vigorously challenged in court and is even opposed by many Republicans. 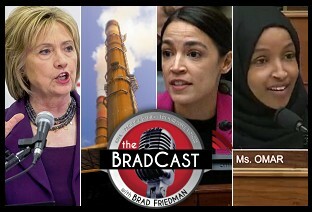 Then, we share a couple of killer Q&A's from recent Congressional hearings by two of the aforementioned freshman Congresswomen. 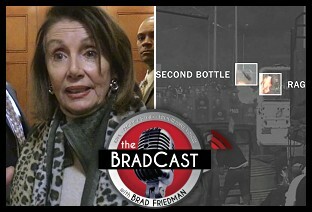 The first is a colloquy in the House Foreign Affairs Committee between Rep. Ilhan Omar (D-MN) and disgraced diplomatic operative Elliot Abrams, who has been pulled out of mothballs to serve as Trump's Special Venezuela Envoy. That, despite his having pleaded guilty to withholding documents from Congress during the 1980's Iran-Contra Scandal probe and his subsequent pardoned by then President George H.W. Bush. Omar calls him out on that, noting that she "fail[ed] to understand why members of this committee of the American people should find any testimony that you give today to be truthful", and asking if he stood by his 1982 Senate testimony dismissing a massacre by U.S. backed troops in El Salvador. Then, in another brilliant round of questioning, this time from Rep. Alexandria Ocasio-Cortez (D-NY) in the House Oversight Committee, the shameful lack of campaign finance laws and ethics rules for members of Congress accepting funding from corporate interests is laid bare. We share both rounds of Committee questioning in full today. The New York Times described Trump's SOTU on Tuesday as "veer[ing] between two moods --- combative and conciliatory." Democratic minority leader Chuck Schumer described it as "sort of like Dr. Jekyll and Mr. Hyde, and the excitement and the enthusiasm was all in the Mr. Hyde parts." A majority of Americans who watched it, however, approved of the Trump's remarks, at least according to early polling weighted towards self-identified Republicans and right-leaning independents. Our two excellent guests today, award-winning opinion journalist HEATHER DIGBY PARTON of Salon and Hullabaloo, and author and political media critic ERIC BOEHLERT formerly of ShareBlue and Media Matters, now a contributor for Daily Kos, join us to make sense of both parts (all parts?) of Trump's at-times disjointed, at-times collegial, and at-times aggressive remarks as they veered conversely between out-and-out lies to something more closely resembling facts but shamefully lacking in context. Did Trump meet the bar set for him by his own White House aides who'd promised new calls for "unity" and "bi-partisan cooperation" in his speech? Is Trump capable or even interested in that? "These State of the Unions are typically the least awful thing Trump does in any given week," Boehlert observes, "because it's a prepared speech, it's poorly written, he delivers it poorly. But there are moments where he does appeal to independents. And then he goes back to the crazies." Says Parton: "If the idea was to unify the Republicans, then yes, it obviously worked. By their measure, I think they probably did what they wanted to do. ... [But] there is no President in American history who is less authentic-sounding than Donald Trump when he's calling for unity and bipartisanship. And they know it." 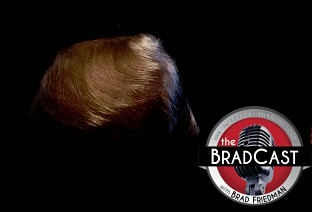 On today's BradCast: Some encouraging news for democracy (at least in Georgia), some predictable lies from the Senate Majority leader, a gentle rebuke for Trump from both parties, and a call for intervention from the Senate Minority Leader, among other things. 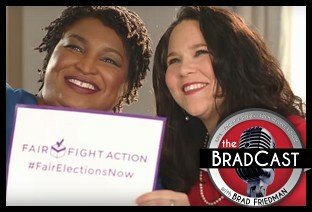 Georgia Democrat and potential U.S. Senate candidate Stacey Abrams, who will be giving the Democratic response to the State of the Union Address on Tuesday, is set to run a television ad during Sunday's Super Bowl in Atlanta with a north Georgia Republican County Commissioner calling for HAND-MARKED paper ballots in the state! Also in the U.S. Senate, Democratic Minority Leader Chuck Schumer sent a letter to Trump's Director of National Intelligence Dan Coats calling for him and the other Administration Intelligence Chiefs to "stage an intervention" with the Commander-in-Chief, after Donald Trump described his own top intel officials on Wednesday as "wrong", "naive" and needing to "go back to school!" on a host of foreign policy issues. Trump's remarks came in response to the Intelligence Community's new annual "Worldwide Threat Assessment" PDF. The report, and Senate testimony from the chiefs about it on Tuesday, argues that Trump is essentially wrong on everything from North Korea, to Iran, to ISIS to Syria and Afghanistan, and on his claims about an imagined "national emergency" at the U.S. -Mexico board. On Friday, Trump caved. He finally agreed to reopen the federal government --- at least temporarily --- after five weeks and the longest shutdown in U.S. history. He pretended he'd made a "deal" with Democrats. In fact, he simply agreed to continue funding the government at its previous levels until February 15. He received zero dollars for his border wall in the bargain, while suggesting during bizarre, inaccurate and, at times, graphic remarks at the White House that, without some sort of "deal" for a wall, he would either shut the government down again in three weeks or declare a "national emergency" to take the money to build it from elsewhere. There were many reasons Trump finally buckled today, including increasing anger from lawmakers in his own party, plummeting poll numbers, news that the IRS was in "panic mode" without enough workers as tax season begins, and flight delays up and down the Eastern Seaboard thanks to a shortage of Air Traffic Controllers, according to the FAA. But there were at least two stories that the Administration, no doubt, was eager to get off the front pages today and over the weekend. One, a stunning report from NBC News Thursday night that Trump's son-in-law and senior advisor Jared Kushner had been rejected for top secret clearance in 2017, for a host of reasons, by two career security professionals at the White House, only to have that security recommendation overruled (along with similar rejections for "at least 30" others!) and granted to him by a Trump appointee. Also, Trump's longtime supporter and dirty trickster Roger Stone --- who helped lead the "lock her up!" charge against Hillary Clinton with the release of hacked emails by WikiLeaks --- was arrested in Florida on Friday morning by FBI officials and charged with seven counts of lying to Congress, witness tampering and obstruction of justice by a grand jury convened as part of Robert Mueller's Special Counsel probe. Following the GOP's fake "outrage" about national security concerns related to Clinton's private email server, which Stone helped amplify, there's no small amount of irony here with his arrest on the heels of news that the Trump Administration appears to have forgone top level security concerns altogether in order to allow Kushner and others access to the nation's most closely guarded intelligence materials. Trump's "deal" to temporarily reopen the government may have served to change the news cycle for a few hours, but it didn't endear him to Republican extremists like Ann Coulter, whose critiques late last year led Trump to break his agreement with lawmakers and demand $5.7 billion for a southern border wall resulting in the five week shutdown. Today she deried him as "the biggest wimp ever to serve as President." While all of these nightmares have been unfolding in recent weeks, few noticed that the Trump Administration's Health and Human Services Department quietly approved a very controversial waiver to allow a Protestant South Carolina group called Miracle Hill Ministries to discriminate against Muslims, Jews, Catholics and atheists in the placement of foster care children. We're joined by criminal justice reporter AKELA LACY of The Intercept today to explain this very real and disturbing outrage which very few have noticed, and how the Administration's partnership with "Religious Right" Republicans under the guise of "religious freedom" is now officially sanctioning religious discrimination in the U.S.
"South Carolina is saying that the foster care statute in HHS rules and regulations does not specify religion as a characteristic on which they are not allowed to discriminate. They say that the foster care program statute says that agencies that receive federal funding can't deny parents based on race, color or national origin, but that because that statute does not specify religion, the request that Miracle Hill accept these families is outside of the law," Lacy tells me, noting that state law in South Carolina bars this sort of discrimination, as do federal non-discrimination laws that the Administration appears to be ignoring. "The other really scary part of this," she notes, "is that, aside from these individual waivers, eighty Republican lawmakers signed a letter to the President in May asking for even further repeal of these federal protections against discrimination. So this is not just something that is being advocated for on a state-by-state basis. This is a quiet effort from the right to change these rules in the interests of mostly Christian organizations." After a few words on Canning's latest article at the blog on the "Political Revolution" embodied by the new freshman class of progressive U.S. House members and the many challenges they are now facing down in D.C., we discuss some of the lessons learned and important stories covered at our little, independent, reader- and listener-supported website over the past decade and a half. Many of the stories we broke years ago --- too numerous to link here, on everything from electronic voting concerns and voting rights to climate change and much more --- have since become part of the national consensus as well as many popular calls for reform. That, even as much (but not all) of our independently verifiable, evidence-based news coverage was marginalized or dismissed by many in the corporate media years earlier. We discuss just a few of those stories today --- too numerous to detail here --- as we look both back and forward on this latest milestone. 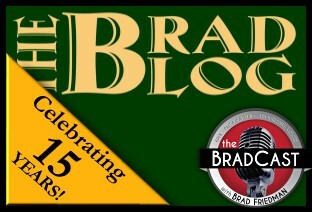 We also offer thanks to the many who have made all of it possible over the years, from our blogging contributors, to radio affiliate partners, to various whistleblowers (publicly known and unknown) over the years. Of course, none of it could be done without those of you support our work via BradBlog.com/Donate. So, if you haven't hit that page in a while, please consider doing so, as we operate solely on the support of folks like you. Seriously. Please consider a one-time donation or, even better, an automated monthly donation of any amount you can afford. I hate haranguing folks for this, but it really is necessary in order for us to continue our work, which we now share on a daily basis with dozens of radio affiliates around the country and world for free! 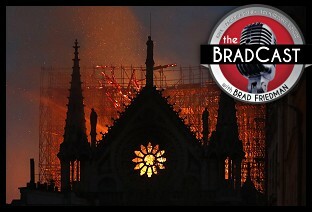 Your support alone allows that and so much more that we do at The BRAD BLOG, The BradCast and the Green News Report to continue. And if I can't ask on our 15th birthday, when can I? So click here please! And thank you! 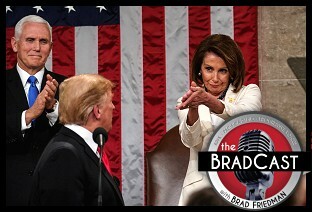 Donald Trump's federal government shutdown nears the end of it's fifth record week, as he folded like one of his own cheap and poorly tailored suits on Wednesday night in his standoff with U.S. House Speaker Nancy Pelosi on delivering his State of the Union next week. At the same time, federal aviation unions issued a dire warning about the ongoing effects and potential critical dangers of the shutdown. We share a heartbreaking story about a 10-year old girl who suffered a broken wrist in stoic silence for a week, because she was frightened to tell her father, a Dept. of Homeland Security employee forced to work without pay. Billionaire crypt-keeper and Commerce Dept. Secretary Wilbur Ross took to the airwaves to, essentially, call 800,000 federal workers whiners for needing to use food banks to feed their families, when they could just go out and get a bank loan instead to cover costs until the federal government reopens. In the U.S. Senate, Mitch McConnell finally allowed votes on measures to reopen the government, one from Rs and one from Ds. Both failed to get the 60 votes needed to overcome filibuster, though the D version --- which did not include funding for Trump's border wall --- received more votes than the R version in the GOP-majority Senate. And Trump's former attorney Michael Cohen learned that he may have to appear before both House and Senate Committees next month, despite threats to his family by the President of the United States. Donald Trump was busy 'making American great again' today by extending the longest federal government shutdown in the nation's history, intimidating and threatening federal criminal witnesses and their families, lying about Democrats and calling the U.S. House Speaker silly names. And --- oh, yeah --- continuing to do nothing about a very clear case of election-flipping fraud. The U.S. House seat from North Carolina's 9th Congressional District remains vacant today, after a state judge on Tuesday declined to order the certification of Republican Mark Harris amid the ongoing investigation into absentee ballot fraud by a GOP contractor hired by Harris. 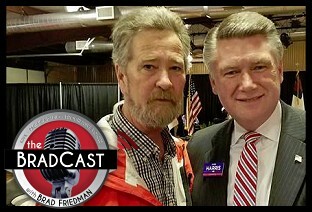 The apparent fraud by the contractor, McCrae Dowless [pictured above with Harris], appears to have flipped the race in Harris' favor by 905 votes. The State Board of Elections investigating the matter was dissolved earlier this month by a court, in an unrelated case which found that Republican state lawmakers had unconstitutionally changed the make up of the Board to disadvantage the Democratic Governor elected in 2016. That was the same year that Dowless was reported to have committed absentee ballot fraud on behalf of a number of other Republicans. First up, the damning opinion issued on Tuesday by a U.S. District Court judge in Manhattan finding Treasury Secretary Wilbur Ross repeatedly violated the law --- and lied about his reasons for doing so --- in adding a controversial question on citizenship to the 2020 U.S. Census. Stern joins the federal judge in calling out Ross' lies about adding the question supposedly at the request of the the Dept. of Justice to help enforce the Voting Rights Act (rather than as a blatant attempt to rig the Census in hopes of boosting GOP political power during the next round of redistricting). "By my count, Judge Furman held that Commerce Secretary Wilbur Ross violated the law by adding the citizenship question in at least six different ways," Stern observes. "When you add them all together, it is a sort of symphony of lawlessness that cannot be ignored by the courts." "Ross just lied. He lied to Congress. He lied in court filings about why he added this citizenship question. It is very clear, black letter law, that when a federal agency like the Commerce Department wants to take some kind of formal action, it has to give the real and truthful grounds for its decision, it has to justify it truthfully. Ross just didn't do that here." He goes on to explain, however, that, despite the encouraging ruling yesterday, the Republicans' stolen Supreme Court will ultimately enjoy the final say on the matter. He also shares his thoughts on whether Ross should be and/or will be criminally prosecuted for lying to Congress and the courts about the issue, as made clear by the federal court ruling. Then, Stern offers some surprisingly good news from SCOTUS today regarding a unanimous(!) opinion from the Court supporting the right of some workers to bypass costly arbitration clauses and file class action lawsuits against employers when they are ripped off by them --- though only in certain circumstances. Still, given the unanimous opinion in this case, authored by Neil Gorsuch of all Justices, we'll take it! 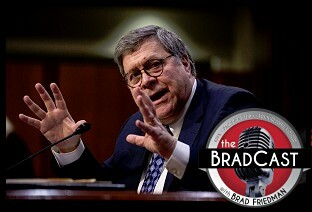 Next, we review Tuesday's confirmation hearing in the U.S. Senate Judiciary Committee for Donald Trump's Attorney General nominee William Barr. Stern warns that his troubling record alone --- "Barr takes a wildly expansive view of executive power and authority" --- might have been enough to derail his nomination in any other time, but for the fact that so many Democrats and Republicans alike are now desperate to replace Trump's wildly unqualified (and, arguably, unlawfully appointed) Acting AG Matthew Whitaker. Barr, who served briefly as AG in 1991 during the George H.W. Bush Administration (where he successfully pushed for Presidential pardons for a number of top officials involved in the Iran-Contra scandal), promised independence from the White House and that he would allow Special Counsel Robert Mueller to complete his probe into Team Trump's alleged involvement with Russia and obstruction meant to cover it up. 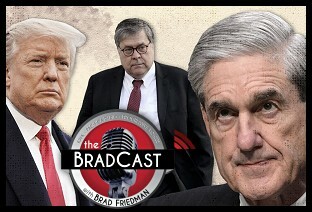 However, Barr equivocated on a number of points related to the probe, such as whether he'd recuse himself from overseeing it if DoJ ethics officials advised him to do so, and whether he would release Mueller's report at all to the public. Stern shares insight and response to a number of other troubling moments from Tuesday's hearings, such as when Barr responded to a question from Sen. Richard Blumenthal (D-CT) about whether a sitting President could be indicted and when he was asked directly by Sen. Amy Klobuchar (D-MN) about whether the Justice Department, under his command, would "jail reporters for doing their jobs". Barr's response on the former was questionable, at best, and downright chilling on the latter, from the man tapped to be the nation's top law enforcement official. "There's just a right and wrong answer here," Stern quips, "and he gave the wrong one." But first, as Donald Trump's federal government shutdown continues over his insistence that tax-payers spend $5.7 billion to begin construction of his wall, we take a quick look back at some of his 2013 comments on who should be blamed for government shutdowns, back when he charged that Presidents, not opposition parties in Congress, should be held responsible. But what he had to say about walls way back in 2004 is even more amusing and/or ironic. We're joined today by food and agriculture correspondent TOM PHILPOTT of Mother Jones' to discuss the safety (or lack thereof) of the nation's imperiled food supply as the shutdown is now days away from becoming the longest in U.S. history. 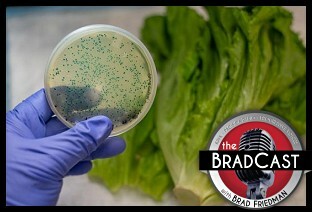 The FDA's lack of all food inspections comes on the heels of the CDC's declaration this week that the second of two deadly E. coli outbreaks in romaine lettuce last year is finally over. "We should be pretty concerned, especially as this drags on and on," Philpott warns. "Any kind of product that we take for granted, mundane products that aren't regularly in the news for causing outbreaks, can cause outbreaks when companies lapse and the regulatory process fails. This is an engineered failure of the regulatory process. It's just a very, very stupid idea." "Who knows how long this thing is going to go on?," he says. "Which, if it does, the food safety situation is going to get gnarly." Philpott's concerns reach beyond the current situation, however, as he explains how the Trump Administration's de-regulatory agenda has already undercut the safety of our nation's food supply. Also, he reports on how the shutdown (and trade war) is negatively effecting farmers (many of whom comprise Trump's base) and craft beer makers (small business owners), along with women, infants, children and others in poverty who rely on government programs for nutrition assistance. 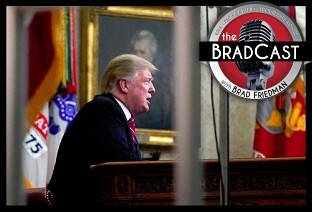 While Trump said today that if Democrats don't agree to his demand for billions in border wall funding he will "definitely" declare a national emergency in order to force the construction of his wall, even folks on the Right --- for example on his favorite Fox 'News' show --- argue that such a Presidential declaration would set a very bad precedent. But, with Americans increasingly blaming Trump for the shutdown by double-digits, and sharing that blame with GOP Senators up for reelection next year, the toughest sting for our Reality-TV President may be that more Americans tuned in to watch Democratic House Speaker Nancy Pelosi and Senator Chuck Schumer's response to Trump's prime-time Oval Office address on Tuesday, than the number of those who watched the speech itself. So much for his "winning" television ratings. On Tuesday night and again on Wednesday, Democratic Senate Minority Leader Chuck Schumer accused Donald Trump of governing "by temper tantrum". The first reference came in Tuesday's Democratic response, with House Speaker Nancy Pelosi, to Trump's televised prime-time Oval Office address meant to gain public support for his demand of $5.7 billion for a southern border wall. The money is needed, Trump claims, to respond to what he described during his 9-minute speech as an immigration and humanitarian "crisis". But the address offered no new policies or information and, at times, parroted word-for-word rightwing anti-immigration, pro-wall commentary from Sean Hannity and Lou Dobbs' programs on Fox 'News'. The second reference to a Trump "tantrum" came today after the President reportedly stormed out of a White House negotiation meeting with Congressional Democrats as the partial federal government shutdown over funding for his wall continues in its third week. The cost of that shutdown to some 800,000 federal workers is rapidly intensifying. Paychecks will not be issued this week for many workers who are already facing extraordinary hardship thanks to the shutdown which Trump has threatened to continue for "months or even years" unless Democrats agree to his border wall demand. But, if nothing new was offered in his Tuesday night prime-time address, why did the television networks agree to clear the time for him to litter our public airwaves with false claims and long-ago debunked propaganda? Particularly since the same networks refused President Obama's request to air his own remarks on actual new immigration policy back in 2014? We're joined today by Media Matters' Senior Fellow MATT GERTZ who charges that the "networks got played." He describes their capitulation to Trump as "cowardly" with the result being "exactly what we said was going to happen: the President used the time to lie to the public." "I don't understand why there's such an urgency to just put the President on television when all of the people involved in producing the news know that he's a liar who is going to lie," he tells me. "It's the most predictable thing in American politics right now --- if the President is talking, he's lying." So why did the networks give up that valuable airtime to allow it to happen? And, were the attempts by media outlets at debunking and fact-checking Trump's false claims during or after the speech actual helpful to the public? We discuss that and the larger challenge for media: "How do you respond to a President who is deliberately deceptive and is constantly trying to make people believe in a reality that is different from the actual one?"